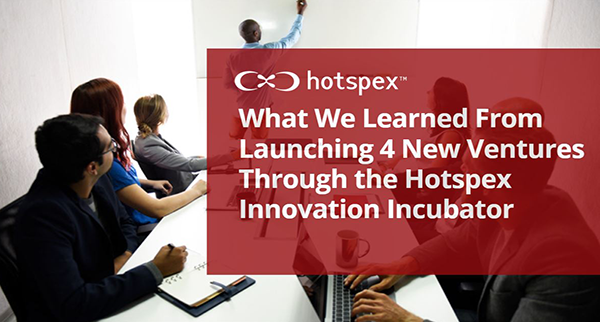 What we learned from Launching 4 New Ventures through the Hotspex Innovation Incubator - Hotspex, Inc.What we learned from Launching 4 New Ventures through the Hotspex Innovation Incubator - Hotspex, Inc. The market research industry has been disrupted just as dramatically as most of the industries that it serves. With pressure from technology driven suppliers offering much faster and cheaper results and consulting firms trying to flex their strategic muscles, traditional players have started to feel significant pressure. To prepare for the future of our industry, we interviewed over 20 CMOs and several more senior marketing and insights leaders. One of the most prevalent insights from those interviews was that innovation is the key to surviving and thriving in the face of disruption. In 2018, Hotspex was voted the #1 most innovative market research company by clients in North America. This has helped our firm reinvest significantly in future innovation and we kicked off an internal innovation incubator. We would like to share 4 new ventures that have been born from this innovation incubator. Each of the 4 new ventures are at different levels of commercialization and we will share one key insight that we gained on each of these innovation journeys. Hotspex integrated its emotional measurement technology and behavioral science expertise with Google’s deep learning to develop a new solution that dramatically improves advertising effectiveness by matching ads with more contextually relevant content. In addition to improving effectiveness for the advertiser, this innovation also improves the audience experience, as ads are considered less intrusive and annoying because of the mood matching algorithm used to serve ads. This innovation led to Hotspex acquiring Wave Media to form Hotspex Media which is now serving many Fortune 500 brands. The solution has been celebrated by several awards and was featured in this WARC article. The lesson here was that you can “leverage advances in science to uncover clues to new innovation territories.” In this specific case, it was our behavioral science team that had uncovered recent studies about the “power of context” and how advertising performs better when it is congruent with the content within which it is served. From there we partnered with Google to leverage the science and test out our hypotheses with 5 of our clients, but it all started from leveraging leading edge science to uncover new ways of creating value for both advertisers and audiences. In partnership with a leading hair stylist in Toronto, Hotspex launched a male grooming brand, Con Moto. The partnership leveraged Hotspex’s proprietary and globally validated emotional measurement technology to identify a distinct, relevant, and ownable positioning. The portfolio of male grooming products were launched on Amazon and have been receiving rave reviews. Future communications will be run using the Hotspex Coherency Index to ensure that all touch points are building and reinforcing key memory cues and structures in a consistent and coherent manner and tone. Here we learned the importance of “putting yourself in your clients’ shoes.” We help our clients launch new products, build brand strategies, and execute across omni-channel touch points, so this process helped us better understand the journey our customers go through. It also helped us uncover new ways to grow the brand through Amazon, which is pertinent given that many of our clients are trying to understand how to win in e-commerce. Hotspex is in the process of building a data aggregation company whereby it will be collecting data from millions of people. Consumers will double opt in to allow their credit and debit card transactions to be gathered in return for various incentives. This data set will provide Hotspex with a deeper understanding of consumer behavior and will provide clients new opportunities to attract new and lapsed customers, while making marketing dollars work harder. The lesson here was to “find ways to integrate different data sources to uncover meaningful insights”. Having invested heavily in new techniques to observe behavior and make sense of those observations through measuring both conscious beliefs, as well as non-conscious associations, the goal is to now get even closer to consumers and include new data sets to our understanding. We have interviewed over 20 CMOs and several other senior marketing and insight leaders to better understand what is keeping them up at night, so that we can help them solve those problems and ultimately improve the offering we bring to market. We are in the process of our new State of Marketing podcast that will bring this content to life in new and exciting ways. We also just launched our new Brand Builders Community to bring together marketing and insights leaders from different industries from around the world. It offers free content curation, invites to exclusive thought leadership events, and access to our new podcast. Here we learned the importance of “getting to know what is keeping your boss’s boss up at night”. We have one boss at Hotspex, and it’s not our CEO, Shane Skillen. Our boss is our client and ultimately, to service our clients as best as we can, we need to understand how we can help them get ahead. Since the insight function ultimately reports into the CMO, we are spending much more time understanding what is top of mind and what is keeping them up at night. These insights should help empower our brand building community while also improving the overall Hotspex value proposition. We hope that sharing our journey across 4 different innovation ventures has sparked some new ideas for you.